let’s start with this stage setting. Created by the famous marc Fisher it shows, stage left, the world of eve, a tree with half an apple, stage right, the world of Adam, the metal legs of a scorpion, used as sup- port for the other half of the apple, the two banks linked by a bridge. in passing we also thank pascal obispo for splitting the apple and therefore also the responsibility for the original sin between Adam and eve. with dimitri vassiliu and his loyal console operator philippe marty. Soundlightup : Dimitri, if I have followed your ca- reer correctly, this is the first time that you have created lighting for a musical comedy. Did you run into specific issues that do not apply to concerts? Dimitri Vassiliu : the difficulty is to remain in between a show and the theatre without either one prevailing. Adam and eve is not quite a show since there are many performers on stage, everywhere, and everyone has to be illuminated without losing the thread of the story, i.e. the singer. We do not work in full-up lighting. the audience has to look in the right places and always in the direction of the important action, otherwise they will never really know where the singer is, yet without neglecting the dancers. SLU : I was told that you have a lot of Ayrton LED projectors in your kit, and even a few new ones! 15 W RGBW LED for the Wildsun 500, with an active heat-transfer gas heat sink and very high-out- put optics. It is easily understood why its flux is so high. And what’s more it’s attractive. DV : in fact, i have a small new strip with 8 leds, cal- led rollapix, which are very pretty, ultra-slim, with a double zoom. When i met Yvan peard and he showed it to me with its zoom, i asked him to motorise it in tilt mode and i pushed him to manufacture a proto- type product for Adam and eve. i wanted small discreet projectors to be set up downstage. ideally in strips. in order not to clog the front of the stage, it had to be very flat and move in tilt mode to aim the beams at the audience or at the stage. sometimes they are slightly raised to illuminate the choreography, or lowered to focus on the sets. it is a fantastic tool. the white leds can be made to flash, it’s great. it allows the illusion of movement. i even asked him to develop a special base to set up the rollapix vertically and enable me to focus on the choreography in all directions, which we were 3 unable to apply in the end since i don’t have the room in the corridors, there is too much action. i also pushed for the versapix, an led projector, which Yvan did not intend to put into production so quickly. this projector is modular and with its quar- ter-light-ring shape it enabled me to create a large ball with facets whose structure is in fact made up of 16 versapix. this makes for an interesting luminaire since each component in each led is controlled in- dividually. But we haven’t had time to programme it so you won’t see it in use tonight. SLU : It must be a nightmare to program such a device! Choreography are more alive and vibrant when the dancers move in beam created by gobo from VL 3000. DV : Quite the contrary. For philou (philippe marty) it’s a doddle (laughs). i have primarily set up Wildsun 500 moving heads on the floor in the set. the advantage of the Wild- sun is that its zoom enlarges in order to take in the set and it zooms in to focus on a specific point. it doesn’t zoom in sufficiently to create a beam but it’s not bad. We also rely on small zoom variled A7 moving heads as i need small and narrower sources to be set up in the sets. there are lots of them hidden just about everywhere. SLU : Did you try other LED projector brands? DV : i used the A7 Zoom a lot, but all things conside- red, i’ve only been using leds for a short time. i’ve been reluctant for a long time since they used to be awful. SLU : So it’s Ayrton who reconciled you with LEDs? Lighting searched mixing the colored beams of VL (color com- binations absolutely beautiful) in the bath of blue from Wildsun 500. DV : You could say that, yes. With Ayrton there are nice whites and truly beautiful colours with depth. We can really work the pastels, true reds and true whites. it’s becoming interesting. What’s more, this manufacturer works on the design of the projector itself. Because if a projector is on display, i would like it to be beautiful. the rollapix is a nice little strip with a beautiful finish. the Wildsun is superb. the back is also quite stylish. it is important not to see large ugly units. i also had them specially chromium-plated in order for them to blend into the décor. it works well, we don’t have this enormous thing, these kinds of black holes on stage, especially when they are switched off. they are there- fore less visible. SLU : Is it a need or a desire to use LED projectors? DV : it has to be said that they have come a long way and therefore it’s getting truly interesting. in order to avoid excess loads on the bridges, excess consump- tion is after all quite practical. SLU : What are the other sources in your kit? DV : Wildsun 500 also on the bridges, the unavoi- dable mAC 2000 wash XB, vl 3000 spot and vl 3500 spot, the Beam 1500 Clay paky backlit on the floor but i may move them. it really works well. We also have a lot of traditional projectors, profile spots etC and pAr 64 strips. 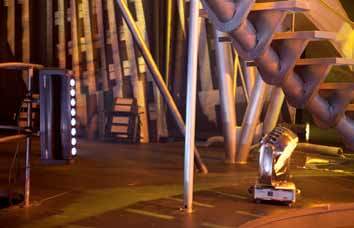 there is, for example, the footbridge on which you are truly within stri- king distance when the actors are on it and we have installed an entire pAr strip there with wide beam. there are also four large Ayrton icecolor 500 led luminaires, two stage left and two stage right to illu- minate the set and Cp 400 that light up a painted canvas. only white illuminates by transparency and the Cp 400 does so very well. SLU : I imagine that you have to move on to the next scene gently. DV : that is a true headache for philou (philippe marty) since there is no blackout between each song. the last cue for the songs is immediately followed by dialogue. The video files provided by Gilles Papain tells the story of huma- nity. Here is the lost city of Eden. The stage is washed in blue. Adam and Eve are revealed by the light beams of the VL 3000’s gobos. Detail of the Rollapix, the new small 8 LED strip motorised in tilt mode, secured vertically on a décor component and Wildsun 500 in chrome version emits very attractive warm colours such as yellows and ambers. The light on the stage setting is rich in nuances. SLU : I was told that you are in demand for nearly all lighting design projects for concerts and tours in France this year with Adam and Eve, Julien Clerc, Benabar, etc. DV : that’s exaggerated, there are a gazillion things that go in every direction and there are plenty of good lighting designers who work a lot. SLU : Would you like to work with foreign performers or groups? Exporting your work as a designer? DV : i would be interested but since i’m used to wor- king with all my mates, i don’t see myself leaving without a personal body guard. SLU : Are you also interested in TV shows? DV : Yes, i would be interested. i did the victoires de la musique for the first time last year for that matter. it was amazing to work with the Clay paky sharpy that had arrived in France. We were the first to use them. i will do the victoires again this year and i will try to change my layout in order for it to be one of a kind and bring something different. I’ve worked on a few sets with vision engineers that i don’t know and since i don’t speak the language of video technology, i’ve had experiences... these days i stipulate the vision engineer and work with him. SLU : Would you like to explore other horizons? DV : I’m interested in theatre and opera. i would like to rub shoulders with this world and see how they work. i also like to do rock groups. i created a tiny design for ArthurH with 8 pAr led that i take on tour,2A7Zoomanditake8pC2kWonsite.ihad aball.itisnotallthateasytodoashowwith8pAr led when you are used to large kits. i racked my brain and i am happy with the result. And musically i like it. i learned that with laurent Chapot i was his assistant for a long time. He is very good at placing things. the right lighting at the right time and it may change in the middle of the refrain, note, rhythm or lyric permitting. But when i arrive here with a musical comedy to illuminate for the first time, i also have a ball. Video production department with the Catalyst screens version PM 4.4 At the back, the Rollapix installed downstage can be easily seen, projecting their blue light ray. Except that the structure of the set, highlighted with white light, retains all of its volume. 5300 parameters for the LED. philippe marty is one of dimitri vassiliu’s regular lightboard operators. He still likes to be the Beta tester and to have the initial problems to put up with. 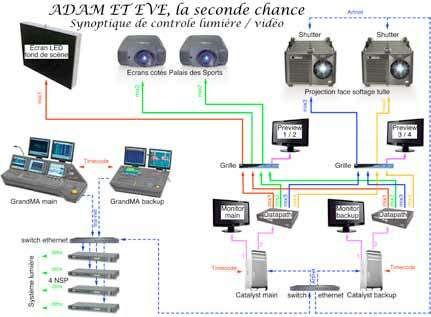 in Adam et eve, he controls all the projectors, automatic with lamps, with leds and traditional pro- jectors on a single GrandmA 1 console and therefore encodes the entire light show. SLU : Philippe, you apparently had fun linking the titles? Philippe Marty (allias Philou) : It is more complicated than a traditional classical concert since there is no blackout between pieces and is therefore longer to programme. At the end of a piece, during the dia- logue, i try to keep the washes i need and i prepare the other machines in the blackout, which are put in place. it’s almost twice as much work but you also have twice as much time. We work together, always with the dancers, acro- bats, choreographer, etc., it is technically longer than for a concert and that’s where it gets truly heavy since there are people on stage, practically everywhere and at all times. it takes three weeks of encoding from morning to evening. But the stage design is beautiful and the show is a lot of fun. it was the first time that i encoded the lighting for a musical comedy and i liked it. SLU : How many DMX outputs do you have on your console? PM : 12 dmX universes on a GrandmA. led projectors are particularly fond of dmX channels. SLU : Did you have any problems with the new Ayr- ton projectors? PM : Only teething problems that their technician came to adjust by upgrading a number of machines. this is normal when launching a product, nothing major and that is how we get ahead. other than that, i like these projectors, the colours are very beautiful. let’s switch to the video production where romain labat controls the media servers to send the videos created by Gille papin. He has three different projec- tion surfaces at his disposal. Romain Labat is light and videoboard operator. He cames from giant image projection. He is a program- mer for giant images on film. But they no longer exist, films have been replaced by high- power video projectors and HD. He obviously branched out into server media and the control of computers that send images to video projectors. He worked for Caméléon and produced their major performances over a period of 10 years. Romain Labat : the principal surface is made up of an led screen. it’s the first time that a screen of that type has been used upstage in a musical comedy. it’s a lighthouse r7, the leds being set apart by 7 mm. the second surface is made up of a net that closes the stage setting. two Christie 20 K video projectors, 20,000 lumen project the images on it in soft edge to cover the entire surface measuring 25 x 8 m.
The Wildsun wash the stage of a deep blue, Rollapix (top right image) illuminate the dancers, the apple is highlighted with A7 Zoom and a follow spot shows the main action, Adam and Eve on the left side. One of the most poetic paintings. disk. this equipment is rented by Alabama. the Cata- lyst sends the video signal to the three screens. the video files provided by Gilles papain, the image designer, are saved on a hard disk and i control the Catalyst with a GrandmA. i load the videos, launch them and handle transitions. And the videos are synchronised by time code generated by the digital audio multitrack of the sound production depart- ment. 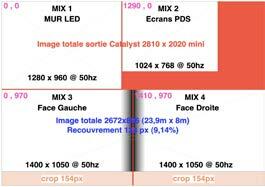 the lightboard also receives the time code and when encoding is completed, the light and video shows will be merged into a single GrandmA, that of philou, who will control video and light on time code. SLU : Your console is a GrandMA 2 and Philippe has a GrandMA 1. Does it work in a network? Romain Labat : Yes , because i have a GrandmA2 that runs on GrandmA1 software. We agreed this with philippe from the start. i was more comfortable with the GrandmA, he preferred to encode on Whole- hog. in the end we opted for the mA network system between consoles. 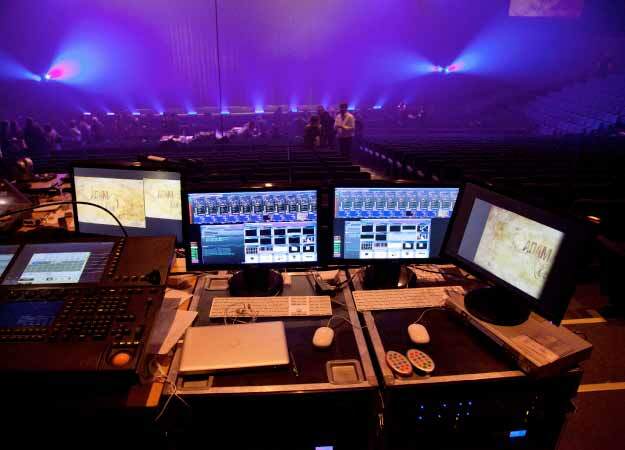 the advantage of controlling video with a lighting console is being able to take advantage of all its power and ergonomics to control the media. You take advantage of the copy, palette, dimensioning tools, which allow for high programming speed. there is no lack of superlatives to appreciate two years of work by pascal obispo and his team. i just have one criticism to formulate, and that is not to have had the photo credits to show you the beauty of the scenes, video and light, working very closely with the stage setting and the artists. 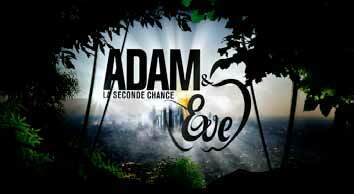 Adam et eve it is not what you call a neatly pac- kaged performance and off you go! each scene, each sequence is dug up from creati- vity and emotion. the show is teeming with sug- gestions brought by the upstage image, which tells the story with a lot of originality and poetry, the lighting supporting the solemnity and dramatic art of the scenes of violence, gentleness and life. i am impressed by the flux and colour of the Wild- sun 500 led moving heads. Called upon almost continuously by dimitri vassiliu, they bring rich, saturated and dense colours, it is almost solid and also magnificent ambers, incredible levels of saturated blues and reds, to this day unimaginable from such a compact source that is slipped into the stage setting All of these «small» sources can be used in close-ups, panning in on a component in the setting or washing the space in colour with their zoom and bringing a new option for the use of depth. the control of leds by light-rings allows for vibration effects and electronics response results in ultrafast strobes, unequalled in speed and very powerful in level. 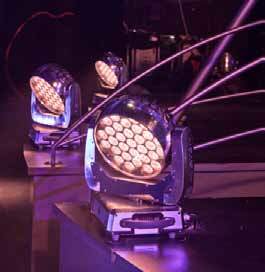 the small rollapix lightstrips are the stars downstage, providing us with violent electronic flashing in white during the Jt, or the ravishing ef- fects of the slow falling of low smoke towards the audience on a blue light ray. At the catalyst output, the video signal is split into four in order to supply the various screens. Dimitri Vassiliu a appris son métier d’éclairagiste avec Laurent Chapot dont il fut longtemps assistant. Il a été tour à tour poursuiteur, blocker, pupitreur, a travaillé pour Jacques Rouveyrollis, Alain Longchamp, avec Régis Vigneron... Un jour Laurent Chapot lui donne le contact d’une chanteuse qui cherchait un éclairagiste. C’était Zazie pour une tournée clubs. 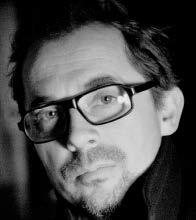 Il a fait la création lumière de ses quatre premières tournées, puis il a rencontré Pascal Obispo. Il enchaine depuis les conceptions lumière pour de nombreux artistes : M, Depalmas, Calogero, Thomas Dutronc, Mylène Farmer... En ce début d’année, Julien Clerc, Benabar... Son secret ? Apporter du confort à l’artiste pour qu’il se sente en sécurité : soigner son entrée sur scène, ne pas éclairer trop le public au mauvais moment... Avoir une vision globale du plateau en permanence. Romain Labat est pupitreur lumière et vidéo. Il était programmeur d’images géantes sur rouleaux de films pour la société Caméléon. Il a fabriqué pendant dix ans leurs plus gros spectacles. Quand ce support a été remplacé par les projecteurs vidéo de grande puissance et HD, il a naturellement bifurqué vers le contrôle des média serveurs et le pilotage des ordinateurs qui envoient les images aux vidéoprojecteurs.